I wanted to make a quick post to show my new children off.. I picked up 6 babies the other day.. Kind of excited to introduce them! Plus, yesterday was the worst day I have had in nail painting in a long, long time. Nothing worked for me. Today was better, but these will be posted up closer to Valentine's Day.. Anyways, moving on! Yay! New kids!! Here we have OPI: I Don't Give A Rotterdam, I Have A Herring Problem, Kiss Me On My Tulips (side note: I have to stifle hysterical laughter every time I see this name.. I seriously have the maturity level of a 15 year old boy. I love it! ), and A Roll In The Hague. Then we have China Glaze: Gaga For Green and Techo. I knew I wanted to do something with IDGAR and IHAHP immediately.. Mostly to prove my dad wrong.. He said they are the same colour. They are not. But.. My idea failed.. 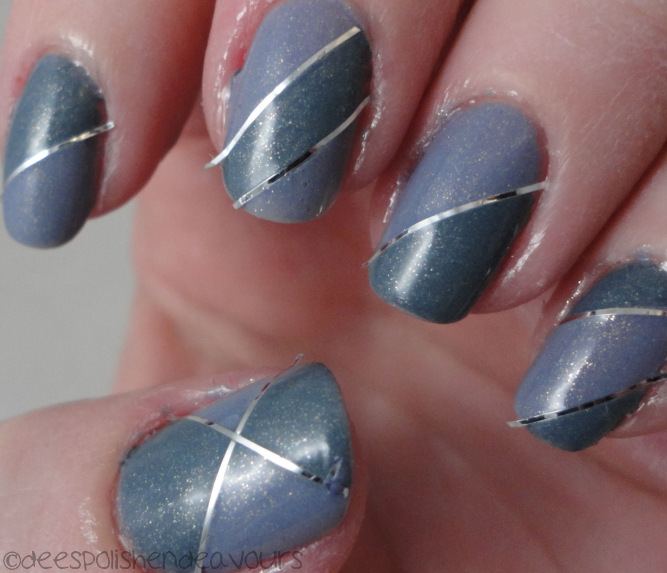 I think the next time I want to use striping tape, I will size them before hand so they fit perfectly.. Even with tiny sewing scissors.. I couldn't snip them enough.. And then of course there is just me.. Tape, fimo canes, rhinestones.. I have to pick at them! Ugh. I like everything about this.. Minus the fact I couldn't leave the tape alone or quite get it to be perfect enough. 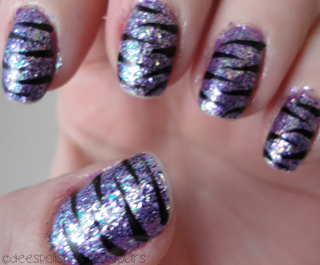 And my gouged thumb nail, otherwise, I loved this. Will revisit some time. Then there is this.. I love this! Minus the tip wear and the fact that the photo is blurry.. BUT.. I was getting ready to go hang out with my bff last night, and the index nail on my non-photographing hand was ruined! The polish came clean off. I was pretty pissed off. I am not even sure why I am posting these fails up.. I think it is to show that not everything works out as perfectly that it sometimes looks in the photos.. There are mishaps along the way. I will be back with some V-Day-esque nails in the next day or three. Take care til then!! I'm glad I'm not the only one that thought that about Tulips lol. I love both these manis! The only time I tried to use striping tape, I couldn't get it perfect either and wound up picking it off. And that's sooo annoying when polish just pops off your finger!